KUALA LUMPUR (Jan 20): The Inland Revenue Board of Malaysia achieved a new record in direct tax collection last year, with RM137.035 billion collected, which is 11.13% or RM13.723 billion more than the RM123.312 billion collected in 2017, the Ministry of Finance (MoF) said today. The last record was set in 2014, when the direct tax collection came in at RM133.700 billion, according to a statement from MoF. "This rise is attributable to increased collection from components of taxpayers such as companies, individuals, petroleum, cooperatives, stamp duty and others. "Besides reflecting the effectiveness of a clean leadership and an administration based on the principles of Competency, Accountability and Transparency (CAT), this increase also shows that economic growth was encouraging in 2018," said Finance Minister Lim Guan Eng. 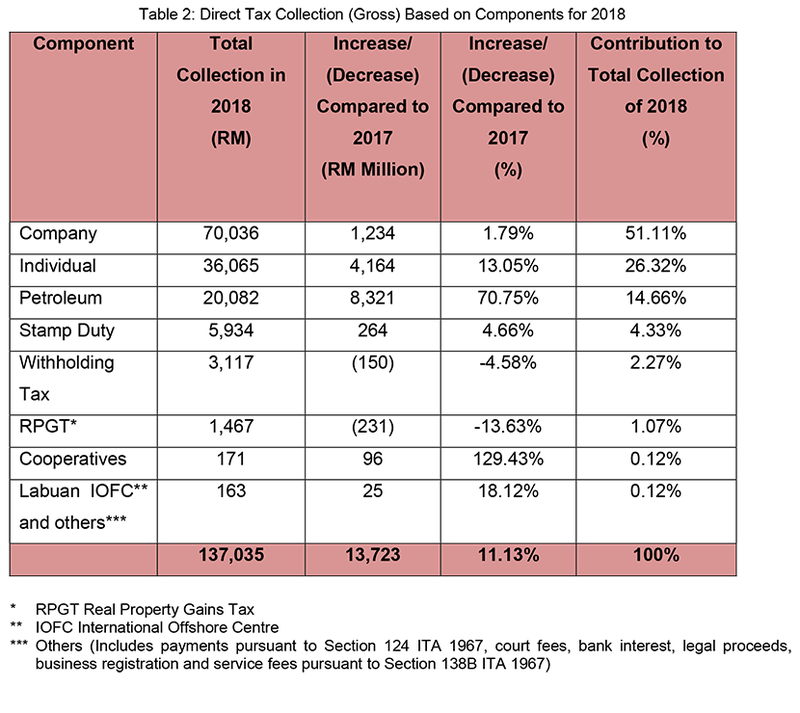 According to Lim's breakdown, revenue collected from income tax other than petroleum contributed RM116.953 billion or 85.35% of the total collection last year. "The corporate component was the biggest contributor at RM70.036 Billion or 51.11%, followed by the individual component at RM36.065 billion or 26.32%, tax revenue from petroleum was RM20.082 billion or 14.66%, stamp duty collection stood at RM5.934 billion or 4.33%, withholding tax collection at RM3.117 Billion or 2.27%, RPGT (real property gains tax) collection at RM1.467 billion or 1.07%, cooperatives tax collection was RM0.171 billion or 0.12% and lastly Labuan IOFC (International Offshore Financial Centre) and other taxes stood at RM0.163 billion or 0.12%," Lim said. Lim went on to highlight that the encouraging tax collection was an outcome of "the effective tax-related strategies set by the Pakatan Harapan Government that came into power after the 14th General Election". Among the strategies were: more professionally conducted tax enforcement activities, specifically involving audit and investigation; focused tax education programmes; improvements to the process of imposing travel restrictions on taxpayers with tax arrears; and strict use of provisions under the Anti-Money Laundering, Anti-Terrorism Financing and Proceeds of Unlawful Activities Act 2001 in enforcement activities. "The high level of integrity and transparency of the Pakatan Harapan Government in spending every cent of tax collected from the rakyat also played a very important role in improving the level of compliance among taxpayers and led to this increase. These factors have directly increased the confidence and trust of the rakyat towards the government and has encouraged them to voluntarily declare and pay their taxes. "The Pakatan Harapan Government also wishes to thank the rakyat who have carried out their duty in paying taxes and hope that the rakyat will continue to carry out this responsibility for the advancement of our country, Malaysia," Lim added. On that note, he urged taxpayers who have compliance issues to participate in the Special Voluntary Disclosure Programme that was launched on Nov 3 last year, and which will end on June 30 this year, that offers low penalty rate of 10% and 15%, to avoid being penalised up to 300% when the programme ends.